A few months ago, I moved almost exactly one mile up Capitol Hill, from an area nearly adjacent to downtown to a more residential and quiet area. My old apartment was kitty-corner to a dance club and Occupy Seattle and had experienced a break-in where the only thing stolen was my old bike. It was a crazy and fun place to live for nearly two years. My new neighborhood is beautiful and peaceful, but the move has added considerably more travel time to any public transit travel outside of the downtown core of Seattle. Andrew Hardin at the University of Colorado recently created an interactive visualization that demonstrates exactly how the move affected my transit times. Seattle is investing in express buses, streetcars, and rapid transit that should increase my transit range, but I still feel public transit in the city has a long way to go. These maps don't reflect the frequent bus delays that can make transfers difficult to time—one of the major advantages of rapid transit. 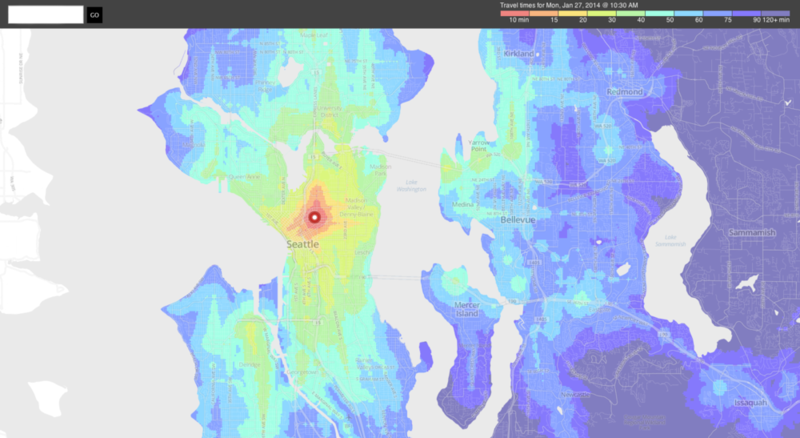 The King County transit system can boast, however, of being one of few systems that allows for bus-to-hike. You can see some of these options off the 520 in Issaquah (southeast). In less than two hours, I can take a series of buses to Mt. Si and hike 3,500 feet to a snow-covered peak. Now that's a different kind of accessibility!